Blessed are you Lord our G-d; G-d of our ancestors. G-d of Abraham, G-d of Isaac, G-d of Jacob, G-d of Sarah, G-d of Rebekah, G-d of Rachel and G-d of Leah. What a group to take along on a search for G-d. Maybe the rabbis were on to something when they drew up this list (although the ancient mothers were originally omitted). These names form a canopy of memory over me much like the tent of Abraham and Sarah—the same tent that is the model on which the marriage canopy or huppah is based. Abraham and Sarah’s tent was open on all sides—as exposed to the elements as it was to G-d’s will. On Father’s Day I will step into Abraham and Sarah’s metaphorical tent—buffeted by the winds of fate—fate that sometimes makes no sense to me. Or worse, makes me despair. The Dads, the grandfathers in our family—the old guard—died in the early 2000s. This makes Father’s Day both sad and joyful as we memorialize them and celebrate their wonderful son and son-law. So here we are, Ken and I, one step closer to becoming the family elders—the old guard ourselves. The traditional Jewish image that I think of when merging joy and sadness is a wedding. Hasidic folklore says that weddings are haunted because both the dead and the living dance together. The new fangled image for that maxim is the wedding video where there are so many of my dead who are alive on that tape (yes I got married in the era of VHS), dancing around Ken and me. It breaks my heart to watch it and so I haven’t in many years. But here is what I would see again: My father-in-law Dennis spiffy in his tux, his smile illuminating the tape brighter than the lights the videographer lugged around. Dennis, whom I called Dad too, died much too young of a brain tumor. In nine months he was gone and the world felt more precarious to me with his passing. Our wedding video also features my father who was just beginning to decline from Parkinson’s disease. He and I shuffle down the aisle towards stairs leading to the huppah. It was only after viewing the video that I noticed Ken extended an arm to help my Dad up those steps. But that’s not the father that comes into my mind when I remember him. My dad had several incarnations. One of my favorite pictures of him is from the Second World War. 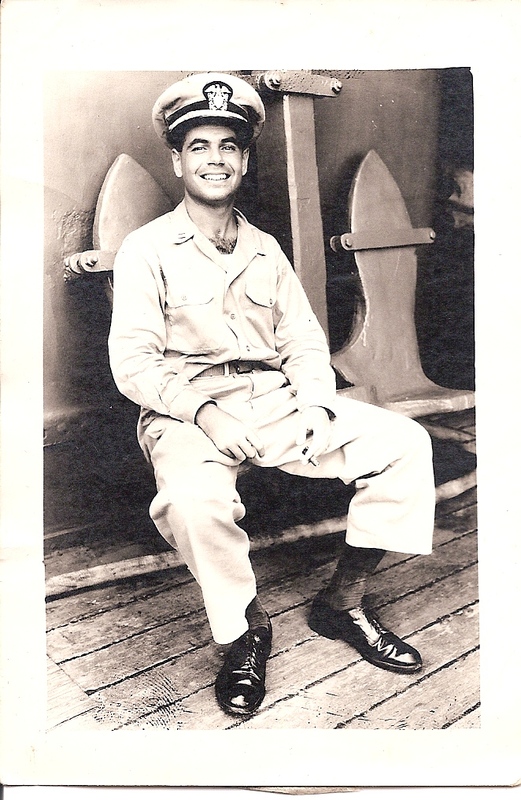 He was a young ensign—twenty-two years-old and recruited into the navy as a Ninety-Day Wonder straight out of college. Ninety-Day Wonders were fast-tracked to become officers in just three months. That was my father—a wonder unto himself. A man who could learn anything quickly and completely. Then there is the father who had all three of us children in his forties. Throughout my childhood I never noticed that my athletic, handsome father was so much older than my friends’ dads. He was the dad who took brisk walks to do errands a couple of miles away. He put his patriotism on display at every holiday that called for a flag by leading us around the house to the beat of a John Philip Sousa march. He mailed me birthday cards as sweet as the cereals he forbade me to eat. When I had just crossed over into adulthood there was the Dad who wrote me letters. He penned his advice in neat primer-school ink, placing his missives in envelopes in which he used blue ink for his return address, green ink for me the addressee, and red ink for the return address again, this time on the flap of the envelope. And then there was my Dad in his old age, frightened and confused, after he was stopped for driving over the median. The police officer didn’t have the heart to write him a ticket. He called my mother instead to tell her that he had no choice but to revoke Dad’s license. Somewhere between the Amidah’s blessings for understanding and salvation comes an invocation for health to “remove from us all suffering and grief.” I don’t expect that to happen especially when I think of my dads. After all, everyone is vulnerable in Abraham and Sarah’s tent. But I do pray that G-d sustains us in memory and love on Father’s Day and everyday. 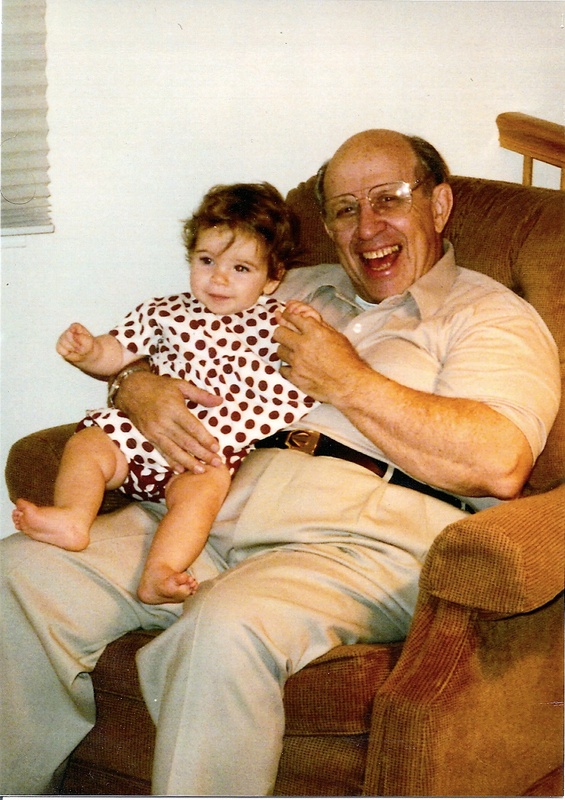 This entry was posted in Aging, family life, Judaism, Parenting, parenting, Parenting, relationships by judy bolton-fasman. Bookmark the permalink. You have touched my heart. Beautiful writing. Lovely post.